With the increased competition in the World Endurance Championship's LMP1 class, everyone's wondering who's really the fastest this year. Porsche looked great at the Prologue, but Audi was fast during practice for the 6 Hours of Silverstone. It's Porsche, though, who'll take up the entire front row of the grid. 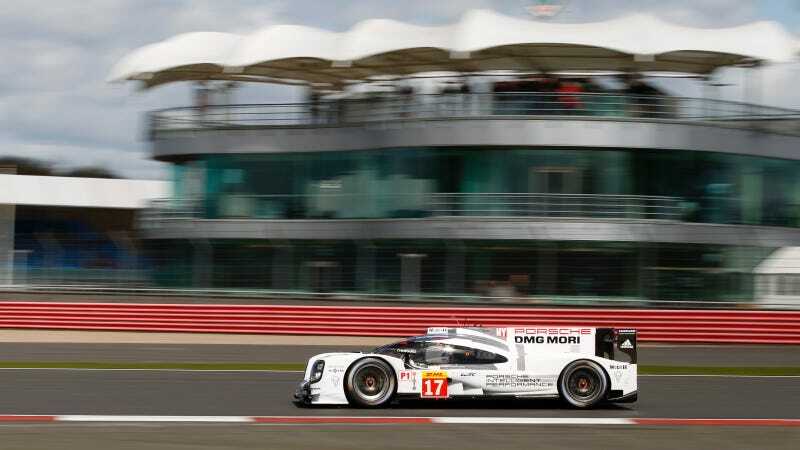 The number 17 Porsche 919 duo of Mark Webber and Brendon Hartley nabbed pole for the 6 Hours of Silverstone, with Porsche's number 18 sister car driven by Neel Jani and Romain Dumas qualifying right behind in second. WEC switched up their qualifying procedure this year so that an average of two drivers' best laps is what counts. This is presumably to prevent teams from having only one ultra-quick time trial superstar make up for a dud of a teammate and qualify higher up than the team deserves. Hartley put down the fastest lap of the two #17 drivers with a 1:39.534. Fortunately for Porsche, all four of their qualifying drivers this weekend are ridiculously quick. Timo Bernhard will drive with Webber and Hartley in the #17 car for the race, and Marc Lieb is the third driver on the #18. Rain is expected to mix things up at Silverstone this weekend, prompting the team to hedge any optimistic statements they make on how the car will perform. "This qualifying result is the first reward for the tough job of testing," said team principal Andreas Seidl in a release today. "We will be happy for one night now, but certainly the race is what counts. We have seen on long runs and in the rain that we still have work to do." Hopefully all the cars are a good in the rain as they are in the dry. According to Motorsport.com, only 1.9 seconds separated out the top six cars. If (huge if here; it is endurance racing, after all) all the cars make it reliably through six hours of racing, this should be a ridiculously close fight. The full qualifying results for all classes in this weekend's 6 Hours of Silverstone can be found here.